1. 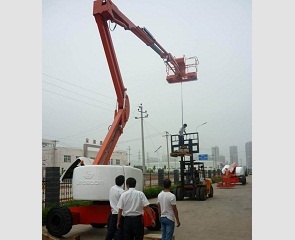 Wide operating range: 355°full direction operation at the height from 0~ 55 ft (16.8m), with a horizontal reach max. by 25 ft (7.62m) and a crossing height of 24 ft 6 in (7.5 m). 3. Powerful driving force: The engine is of famous international brand, large in power and excellent in gradeability. The maximal gradeability can be up to 30%~40%. ● High strength steel for booms for reduced weight with improved security.